Today, more things than people are connected to the Internet, more mobile than fixed broadband subscriptions are active and more than 50% of the world’s population lives in cities. Smartphones and the mobile services and apps that run on them have become the predominant interface between citizens and the so-called “Smart City”. This however, poses difficulties for cities and local governments that are faced with a plethora of new challenges in a changing public service context. This paper provides nine inhibiting and contributing factors that form initial steps in re-thinking what cities in general, and Brussels specifically, should focus on in their efforts to becoming “smarter”, with mobile as a key starting point. À l’heure actuelle, davantage de choses que de personnes sont connectées à internet, le nombre d’abonnements au haut débit mobile dépasse celui des abonnements au haut débit fixe et plus de 50 % de la population mondiale vit en milieu urbain. Les smartphones et les services et applications mobiles qu’ils exploitent sont devenus l’interface prédominante entre les citoyens et la ville dite « intelligente ». Pourtant, cette réalité pose certains problèmes aux villes et aux administrations locales confrontées à une multitude de nouveaux défis dans le cadre des services publics en pleine mutation. Cet article présente neuf facteurs défavorables et favorables constituant une première étape dans la réflexion sur ce que les villes en général, et Bruxelles en particulier, devraient concentrer leurs efforts en vue de devenir « plus intelligentes », en prenant comme point de départ la technologie mobile. Tegenwoordig zijn er meer dingen dan mensen verbonden met het internet, zijn er meer mobiele dan vaste breedbandabonnementen en woont meer dan 50% van de wereldbevolking in steden. Smartphones en de mobiele diensten en apps die hierop draaien zijn de dominerende interface geworden tussen de burgers en de zogenaamde “smart city”. Dit zorgt evenwel voor problemen voor steden en lokale overheden die zich geconfronteerd zien met een overvloed aan nieuwe uitdagingen in een veranderende publieke context. Dit artikel bevat negen remmende en stuwende factoren die de eerste stappen vormen voor steden in het algemeen, en Brussel in het bijzonder, om hun pogingen om “slimmer” te worden scherp te stellen, met het mobiele als belangrijk uitgangspunt. 1The year 2008 signified a turning point in the field of smart cities and mobile research for three reasons. For the first time, (1) there were more mobile than fixed broadband subscriptions, (2) more “things” than people were connected to the Internet, and (3) more than half of the world’s population lived in cities [Burger, 2012; Evans, 2011; UNFPA, 2007]. In this context, cities and local governments are exploring the role which new ICT (information and communication technology) services and products can play in increasing the quality of life of their citizens, a quest often captured in the “smart city” concept [see for example Hall, 2000; Joroff, 2008; Campkin & Ross, 2013]. 2These three shifts also point to the fact that smartphones are – for now – turning out to be the predominant “interface objects” which mediate a growing range of urban tasks and provide primary access to smart city services [Townsend, 2013; Greenfield, 2013]. Mobile apps are the connection between physical location and the virtual information which can be linked to it and, as such, are a core part of moving towards “smarter cities”. The experiments governments have undertaken in the field of mobile government (or m-government) have been the subject of a relatively recent stream of literature [see e.g. Kushchu & Kuscu, 2003; Palka et al., 2013; Abu Thair & Abu-Shanab, 2014] which focuses on the challenges governments face in this regard. The main questions dealt with in this article is how this idea applies to the Brussels-Capital Region, and which factors either inhibit or contribute to the development of a successful mobile strategy in order to go beyond the cautious steps which are currently being taken [see e.g. BRIC, 2014] and move towards a “smarter” Brussels. 3In order to answer these questions, the smart city concept and its current interpretations are examined, followed by an introduction of the theoretical framework and methodology applied. 4The interest in the smart city concept on behalf of the public, technology firms, academics and the media has increased in recent years, taking an almost science fiction-like line somewhere between concerns about control, freedom and privacy [see e.g. Hollands, 2008; Joroff, 2008; Greenfield, 2013; Townsend, 2013] and enthusiasm about increased efficiency, sustainability and a better world with a higher quality of life for everyone [see e.g. Caragliu et al., 2009; Lindsay, 2011; IBM, 2009]. Establishing an all-encompassing final definition of the smart city is difficult, as projects, opinions and initiatives in the field are diverse. 5Research shows two juxtaposed approaches to the smart city. The first approach adheres to top-down dynamics, often closely related to the technologically deterministic idea of a “control room” for the city, striving towards measurement and optimisation [IBM, 2009]. Certain kinds of top-down vision have been heavily criticised, with the main arguments being that they are dictated by corporate interest, entail questions of control and privacy and may not necessarily be sustainable from an environmental viewpoint [Greenfield & Shepard, 2007; Greenfield, 2013]. 6These techno-deterministic or top-down viewpoints are contrasted by a more experimental, bottom-up understanding of what a smart city could be, with change coming only from the people “using” the city [Lindsay, 2011]. However, to rely solely on bottom-up processes would also be unlikely or even unfeasible, as citizens are not removed from their wider urban context [Hamdi, 2004; Berg, 2012]. 7Since “change seldom arises from purely top-down or bottom-up systems and processes” [Shepard & Simeti, 2013], a more nuanced interpretation is proposed, combining top-down and bottom-up approaches and establishing the smart city as a platform which fosters the collective (local) intelligence of all affected stakeholders [Campkin & Ross, 2013]. This means looking at the smart city as a local innovation platform, i.e. a meeting place where the public sector, private interest and citizens can come together to generate new value and collaborate and innovate together. Given that smartphones have been accepted as an important interface to begin tackling smart city challenges (for now) [Townsend, 2013; Greenfield, 2013], the role of the city as a platform is of particular relevance. All stakeholders need to be involved in order to create useful and successful applications in a complex urban context. 8In this sense, the city is seen as a stakeholder, playing a value-adding role in a mobile service business model (i.e. a complex value network). 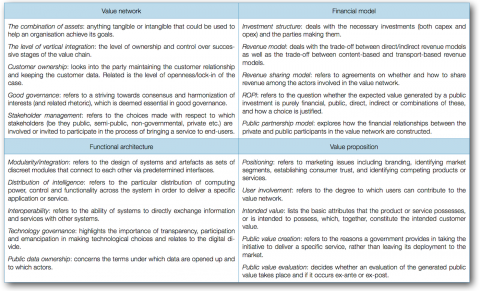 Value networks consist of stakeholders, roles and relationships which need to find a strategic fit [Stabell & Fjeldstad, 1998] to deliver value (i.e. innovative mobile apps) to end users [Jullien 2004; Chesbrough 2006]. 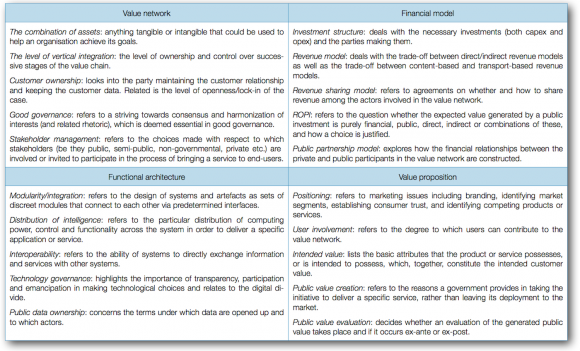 This operationalisation of the value network and the inclusion of public institutions proposed in Walravens & Ballon  is used to guide the data gathering and analysis as both a theoretical and methodological framework (see also Table 3). 9In the spring of 2013 and 2014, 22 semi-structured expert interviews were conducted with representatives from several cities, government administrations, developers and other interest groups active in the mobile application ecosystem (Table 1). 10Semi-structured interviews allow flexibility, as topic lists do not need to be followed religiously and can be modified depending on the expertise or the issues raised during the conversation [Rathbun, 2008: p. 698]. Of course, the data collection is dependent on the will of the interviewee, and the circumstances in which the interview takes place can have an influence (such as location, time limitations, etc.) [Rathbun, 2008]. After several attempts, MIVB-STIB was the only Brussels party with a mobile app which did not agree to participate in the interview rounds. To complement this material, policy documents such as the Brussels Region ICT plan and the Brussels Region Informatics Centre (BRIC) 2014 white paper were analysed. The material serves as input regarding the current state of the mobile services policy in the Brussels Region and in the country, and is referred to throughout this article, using quotes or otherwise. The business model framework and matrix introduced above were used during the interviews to compose the topic lists and to structure their analysis. 11Next to the literature study, policy document analysis and expert interviews, statistical data on all the available Brussels mobile apps were gathered (a snapshot of the situation in October 2013 of both commercial and publicly created apps). The two main data sources were the App Store and Google Play Store, as iOS and Android represented 98% of the mobile OS market share in Belgium at the time [HowWeBrowse, 2013]. Each source was scraped for results related to Brussels, using the name of city in four languages (English, French, Dutch and German). After removing irrelevant apps from the database, a list of 185 apps related to Brussels in the App Store and 136 apps on Google Play remained. The theoretical framework and parameters of the business model matrix (Table 3) were used to identify relevant and indicative parameters in the (relatively) large dataset and to evaluate the weight or importance of certain characteristics of the apps. This statistical data, combined with the document analysis and expert interviews, will give us both a general and detailed overview of the related app landscape in the City and Region of Brussels. From this data gathering and the detailed analysis of international urban mobile apps in Walravens & Ballon , our aim is to come to a set of inhibiting and contributing factors in a successful mobile app strategy. We shall first look briefly at the current ICT and mobile policies in the City and Region. 12The Region, the City and the municipalities all have competences related to ICT: for example, the City and the municipalities are responsible for their own websites and any online services they wish to offer to citizens (e.g. social media communications), but municipalities can opt to use some of the Region’s ICT-services as well (e.g. Irisbox). Open data are also approached in an uncoordinated manner, with GIS data managed and opened by the Brussels Region Informatics Centre (BRIC), while more typical datasets (e.g. ATM locations, public toilets, etc.) are the responsibility of the municipalities, and in the case of the City of Brussels, are opened up by GIAL (Centre de Gestion Informatique des Administrations Locales), a non-profit organisation which provides ICT-services to local administrations. This division of competences and service offers can make the development of common policies a challenge. 13Although Brussels is known for many of its positive and negative facets and scores quite well in terms of its competitiveness, it is generally not perceived as a smart city and usually scores very low – or is not present at all – in various smart city rankings and indices [e.g. Cohen, 2012; Ericsson, 2013; GSMA, 2013; IBM, 2009]. Although a Regional ICT policy plan is in place for the 2010‑2014 period, it lacks an integrated vision related to mobile services and, in some cases, in the execution of its promises. 14While there are certain issues and questions to be raised (for example on ICT-expenditure in Hillenius, 2013 or the continued balancing act between Über and the taxi companies), the Region also takes positive initiatives in the area of mobile services, launching initiatives such as FixMyStreet Brussels. These will be analysed in an attempt to derive a set of inhibiting and contributing factors. In what follows, we will briefly zoom in on what is currently available in Brussels-related mobile apps. 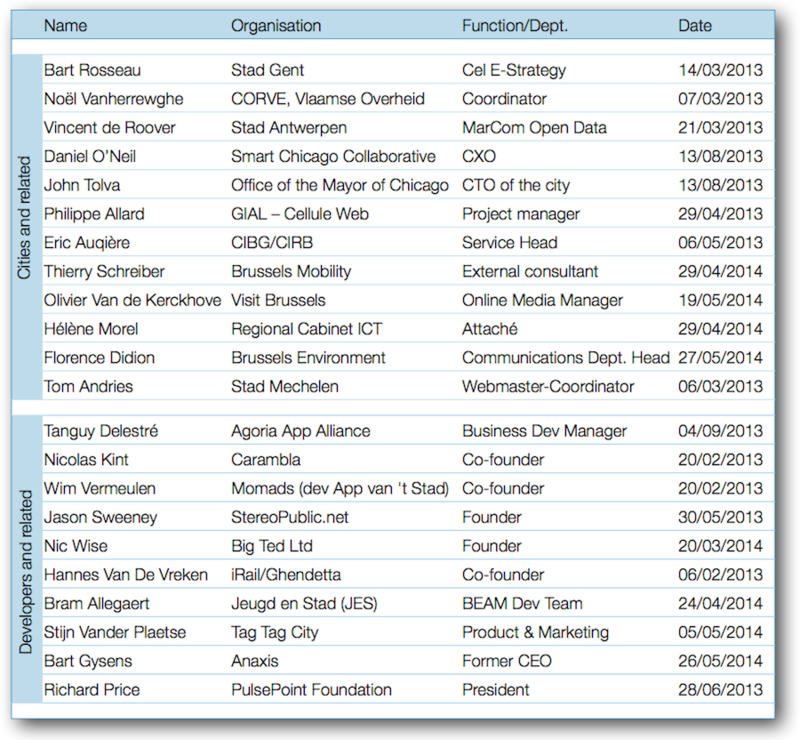 15Based on the scraped data from the app stores, this section takes a look at the current status of the Brussels app landscape. iOS is the biggest platform, with 58% of the Brussels apps available for iOS and 42% for Android. In the case of Brussels, 31 applications out of a total of 321 were available both for iOS and Android, representing just under 10%. The Region and City of Brussels seem to prefer offering apps for both platforms, effectively covering 98% of all mobile OSs in Belgium. 1662% of Brussels-related iOS apps are available for free. 10% of applications are priced at € 0.89, which is the lowest possible price setting in the App Store. 7% are available at € 1.79, 9% at € 2.69, 7% at € 4.49 and only two applications were priced at the highest price point for all Brussels apps: € 5,49. There is no particular theme connecting the highest priced applications, other than the fact that they seem to offer more detailed information or specific features (e.g. audio guides or a city game). Given that there has been a longer tradition of free apps from Google Play, only 15% of the available Brussels apps were available for a fee. 17The success rate of the Brussels applications from the App Store and Google Play is difficult to measure: Apple does not indicate the number of downloads for each app, and for Google Play, the only measure of success or use is an indication of downloads in quite broad ranges (e.g. 5 000‑10 000 or 100 000‑500 000). Although a proxy, it is interesting to note that the mobile app for STIB, the Brussels public transport company, is only one of three Brussels-related apps which has been downloaded at least 100 000 times. “Travel” and “Transportation” are by far the most popular categories (62% combined). There are no official statistics pertaining to the size of the Brussels or Belgian app economy, but the best effort comes from ICT-interest group Agoria, which estimates that 1 000 developers are currently active in Belgium, a growth of 27% compared to 2013 [Konings, 2014]. Statistics pertaining to the origin of the developers creating Brussels apps are also not available, but a sample test of the database reveals that a significant portion are not from Brussels or Belgium and a lot of available apps are of questionable quality. It is important to note that Brussels-based mobile software developers are supported via the software.brussels cluster, including companies like Tapptic, Appsolution, Movify and others. 18The number of official apps by the City of Brussels, the Region or any of its institutions is limited. 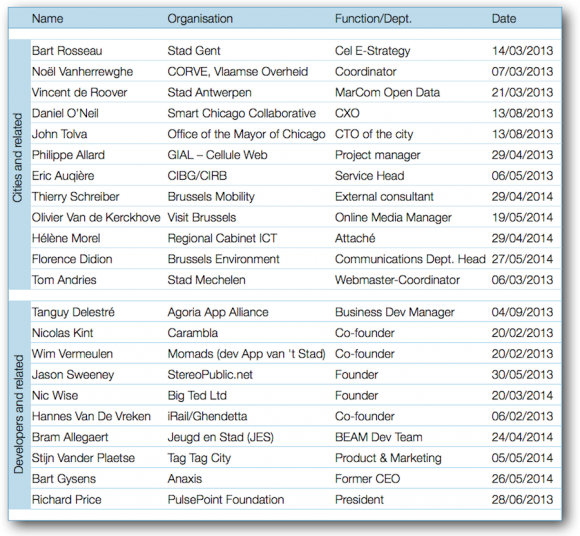 Table 2 provides an overview of the official apps for Brussels. All of these apps are available for free, with no in-app purchases required or possible. 19The be.brussels app applies to the Brussels-Capital Region and offers a map with points of interest and useful phone numbers, as well as direct access to the Region’s social media streams. Brussels Gardens was created by Brussels Environment, one of the Region’s administrations responsible for the study, monitoring and management of air, water, soil, waste, nature (green spaces and biodiversity) and so on. The app provides an overview of the green spaces and their uses in the Region as well as information on the history of the green spaces, their special characteristics (classified site, nature reserve, archaeological site, etc. ), and the conservation of the plants and wildlife found there. The same administration also developed a recipe application which highlights seasonal fruit and vegetables, with some degree of success (Didion, 2014). The City of Brussels app only pertains to municipal Brussels and was developed by GIAL (see above). It provides news, links to public transport information, contact information for the city’s administrations, links to the city’s social media streams and a map with points of interest. Already mentioned above, FixMyStreet Brussels is the local implementation of the well-known issue reporting service, first developed in the UK (Auquière, 2013). It allows citizens to report issues with city furniture or in the public space, but is limited to potholes, bad road surface or missing road markings in the case of the Brussels Region, although its functionality is gradually being expanded. STIB mobile is the official app of the Brussels public transport company and allows users to consult real-time departures and timetables at STIB stops. The final official app is Visit Brussels by the tourism department of the Region, bringing together all kinds of touristic information and offering a city guide. 20For each case, including those in Walravens & Ballon , all of the parameters of the expanded business model matrix described in Table 3 were discussed in detail, and each analysis provided more input for the development of the set of inhibiting and contributing factors introduced in the following section. 21This section will present the inhibiting and contributing factors related to the successful creation, distribution and/or adoption of mobile services in an urban context. These factors are derived from the conclusions of the cases briefly described above and are guided by the parameters of the extended business model matrix in Walravens  (see also table 3). No stark distinction between inhibiting and contributing factors is made: these sections describe how certain factors under different circumstances can play to the advantage or disadvantage of a successful mobile vision for a city or local government organisation. 22The role of the user in the mobile services ecosystem is changing, among other things under the influence of social media [Dörk & Molteyne, 2011]. Apart from having more and more immediate communications resources, end users are increasingly approached earlier on in the design process of new services, using innovative methods, e.g. in a Living Lab setting or open innovation context [Schuurman et al., 2012]. This is of particular relevance in mobile service development. Although an argument is sometimes made for soft launches of digital services (or “minimum viable product”), the end users” patience with mobile apps is very short: app developers basically have only one chance to engage users, since apps are very easily downloaded and then forgotten if they add no real value. “You try an app once and if it doesn’t work, you are dead. […] It is the first time this is so hard in marketing. You only get one chance to make a first impression and with apps this is more true than ever” (Vermeulen, 2013). Next to the actual use of the app, its usefulness should also be evaluated in the ideation and development process. This approach is in line with the view of the city as a local innovation platform, and universities and the local research community can certainly play a role and provide assistance where needed, to ensure that investments are not made in vain. 23A second important factor in the potential success of mobile city services is the role of internal change agents. This term comes from change management and organisational literature and usually refers to the role of managers in the restructuring of organisations [Pathak, 2010; Hartley et al., 1997]. In our operationalisation of this factor, we refer to a shift in culture or mindset when it comes to digital or mobile initiatives, and carrying out or promoting this message. This is of particular importance in public service settings where the goals are more comprehensive (holistic), qualitative and more political than in others, and the role of internal change agents can been seen slightly differently than in commercial operations [Hartley et al., 1997]. Apart from a vision of mobile services at the city management or political level, there is a large potential for the right enthusiastic people in the right places. “This whole movement [of open data] has been characterized as being very bottom-up, but the truth is if you don’t have a chief executive [in the city] who supports this, it probably won’t work” (Tolva, 2013). The involvement of internal change agents can thus be a powerful contributing factor which is not always easy to generate or foster. 24The organisational structure of a local government and the different governing levels it is composed of can both be a contributing or inhibiting element. As illustrated above, the various levels of governing in the Brussels area, with the Region, the city and the 19 municipalities and their partly overlapping competences and many levels of decision-making, make it very difficult to successfully initiate holistic projects related to digital or mobile services. This distributed organisation structure (or rather combination of different structures) can however also have some benefits: it allows the Regional departments for example to take their own initiatives, without potentially lengthier processes to get something approved (e.g. Brussels Gardens). In any case, coordination and communication are critical elements, and the case of FixMyStreet Brussels demonstrates that such an effort is indeed possible, but not easy to set up. “The difficulties are rarely technical. The biggest challenge is the change management that is behind it” (Auquière, 2013). This should be complemented by a political vision which is followed up in its execution, to avoid splintered initiatives (see local innovation platform approach). Formulating and supporting a clear vision is a crucial aspect to a successful smart city strategy. It also leads to the question as to whether a city should even be creating its own applications, or at least in which cases. “The question is not whether a city should go mobile. The question is: what can a city do for its citizens that it can do better on mobile than on any other screen? And then it should do that.” (Vermeulen, 2013). 25The (technological) choices that have been made by the local organisation in the past determine the path it is on and how easily a mobile perspective can be added. This might occur with respect to infrastructure for example, when choices have been made for technologies which do not lend themselves easily to a mobile interface, or when an existing content management system (CMS) needs to be adapted to be accessed from mobile devices. “We decided to link our CMS not only to the websites, but also our mobile apps, so there is only one, central entry point” (Andries, 2013). Additionally, an important potential inhibitor is the inefficiency and cost of switching to a different technology [Liebowitz & Margolis, 2000]. A local government might have a vision for mobile services to tackle parts of urban challenges, but be restricted to pragmatic solutions by decisions which were made in the past and are highly inefficient to overcome. 26This article has, in several instances, pointed out the potential importance of open data and of providing support to developers who create apps and services for the city. It is becoming more commonplace and accepted that open data will be core to the digital strategy of cities in the coming years, with “open by default” becoming the motto. “For the most part we have pushed app creation to the edges of government. That is both a resource statement as well as an acknowledgment that volunteers and the private sector will probably innovate more quickly and certainly on a scale that government cannot match. So we really don’t create many of our own apps. We put our effort into getting the raw materials for the creation of applications […] We provide the infrastructure in order for innovation and development to happen.” (Tolva, 2013). 27The way in which datasets are opened up and developers are encouraged and supported in the process appears to be a determining factor in the success of open data initiatives [Summers, 2010; Colpaert, 2013]. The licences which are created to regulate the use of the data also need attention, since disparate licences may prohibit the combination of certain data sets, e.g. those provided by different authorities or levels of government. The open data approach in the City and Region of Brussels would benefit from more coordination and vision, beyond what is currently proposed [see e.g. BRIC, 2014]. Opening data can thus be a very powerful contributing factor to a flourishing app economy in a city, but it needs to be very well handled, promoted and supported to generate actual return. 28The way in which the cooperation between the different stakeholders in a mobile service initiative is set up, formalised and executed can also play an inhibiting or contributing role. Public-private partnerships are a typical example of such a cooperation model. In light of the changing role of the user, the term PPPP has also been introduced to refer to public-private-people partnerships, giving a more prominent role of the user. In cases where such cooperation with citizens is formalised and their input is an integral part of the ideation, creation, launch and promotion of a mobile city service initiative, the chances of success can be higher. The cooperation model could thus be seen as a contributing factor. Local governments should be especially careful and critical in public procurement processes and in deciding which companies to develop relations with and under what terms, in an effort to safeguard the balance between corporate interest and public value. 29It should be clear that an essential part of achieving the adoption of a new mobile service is promotion and communication with respect to citizens. The adage of “build it and they will come” has already been disproven on many occasions, and the clear communication of what a particular service can contribute to citizens is crucial in this case. At the core, there should be an urban challenge which could be tackled (in part) with a qualitative mobile service, rather than a marketing trick which displays a city’s “smartness” (barring perhaps apps with a city marketing purpose). When an urban app which cities would like to see adopted has a particular public value, it is a challenge to stand out in the current flood of apps. “I stopped development because there were just so many apps. When I released it there were maybe five other apps. After about three months there were more than 50. It wasn’t a field that was making money anymore. […] I don’t think you can make a living off it anymore, the market is too saturated. I think that’s true for apps in general.” (Wise, 2014). 30An ever returning question cities raise – particularly in times of economic downturn and when efficiency is sought – is what the return on investment is for them, either financial or otherwise. Likewise, the benefit of opening up data is also often questioned, and research is only beginning to explore its potential value. Most recently, Transport for London performed an evaluation of their open data project, following the same protocols they use for evaluating transport projects, and found that around 500 apps were developed using their real-time open data, 5000 people were indirectly employed as a consequence and the project saw a return of 58:1. This meant that for each British Pound the organisation put in, it saw a return of £ 58 (a minimal expected return is 1.4:1) [Stott, 2014]. Perhaps most importantly, as a consequence Transport for London stopped developing its own apps. 31Developing metrics and evaluation protocols is key in this regard. There are several goals for which quantifiable KPIs can be decided upon, which are described before an app or service is launched and can be measured afterwards. In other cases and, for example, in light of experimentation and serving hard-to-quantify goals, no immediate return can or needs to be defined. The most important information about whether the return on public investment is viewed as a contributing or inhibiting factor may be obtained by discussing it during the ideation phase of a mobile service initiative and to consider effects other than direct financial return as relevant in some cases as well (e.g. increased public service). “The biggest return we expect from mobile is time gains for the citizens, time gains for the organization and its civil servants, as well as a better, closer way of communicating with our target audiences.” (Andries, 2013). 32As a final and perhaps summarising point, the importance of unpredictable and contextual factors is highlighted. Contextual factors such as timing, unexpected competition, being featured by app stores, receiving positive media coverage and so on, can all inhibit or contribute to the successful adoption of a mobile app or service. Some of these factors can be mediated or taken into account, but others will remain elusive. In the latter case, it is important for the organisational structure or the person in charge of the initiative to be flexible and able to adapt quickly and formulate a response to the unforeseen circumstances. 33This article set out to gauge which factors contribute to or inhibit a successful mobile application strategy for urban areas, exploring the context of Brussels in particular. Based on the premise that advanced mobile services and applications constitute an important part of a future-proof city, we started by highlighting the potential and divergent approaches to what a smart city could be and calling for a focus on the city as a local innovation platform which plays a connecting role between relevant stakeholders. Following a statistical analysis of Brussels apps in the iTunes and Google Play marketplaces, the research provides an initial look into the types, popularity and number of Brussels apps available. Expert interviews then complemented this data to help better understand certain relationships and sensitivities. Based on this input and the analysis of the official Brussels applications, a set of factors which may inhibit or contribute to a successful mobile strategy for local governments is proposed. 34The main limitations of this article lie in the data gathering and analysis stage of the research. Scraping the iTunes App Store and Google Play only provides limited insight into some aspects of the apps found there (e.g. exact number of downloads, actual use, language, appreciation, etc.). Another limitation is linked to the basis of the original business model matrix which mainly explores relationships between actors in value networks and does not examine internal organisational matters in detail. In that sense, this framework and approach would be less suited to evaluating internal organisational processes. The work presents a decidedly strategic perspective and aims to explain the potential roles between the city and the network of stakeholders surrounding it. A final limitation lies in the case work: given the state of flux of the sector, some mobile initiatives quickly scale while others disappear just as fast. 35What the cases do show is that it is difficult to fine-tune the role of the city as a local innovation platform. FixMyStreet is the only case in Brussels which comes close, and shows a mid- to long-term strategy at its core. It is then also a showcase of how a smart city challenge can (begin to) be tackled through a qualitative mobile application which is well thought out and enables citizen participation. In response to the question in the introduction, our conclusion is that Brussels is taking careful steps when it comes to mobile apps, and that this caution can for the most part be explained by the institutional complexity of the Region and the (current) lack of a single mobile strategy as a consequence. Nevertheless, Brussels may learn from the increasing maturity in the mobile (government) apps sector and leverage its potential in order to leap-frog in this area. In order to do so and to label itself as “smarter” than before, a well-defined contact person or institution should put forward an integrated and open-minded approach to mobile apps, involving all relevant stakeholders in the city in the establishment of a local innovation platform. ABU THAIR, H. & ABU-SHANAB, E., 2014. Mobile Government Services. In: International Journal of Technology Diffusion. Vol. 5, No. 1, 9 p.
BALLON, P., 2009. Control and Value in Mobile Communications. PhD thesis, Vrije Universiteit Brussel, Belgium. BERG, N., 2012. The Official Guide to Tactical Urbanism. In: The Atlantic Cities, 2 March. BRIC, 2014. Witboek 2014‑2019. Brussels, April. BURGER, A., 2012. ITU Finds Two Times More Mobile Than Fixed Broadband Subscribers. ITU, 15 October. CABINET MINISTER BRIGITTE GROUWELS, 2012. Beleidsplan Informatica 2010‑2014: Brussel: Een Pragmatische Ambitie. Brussels. CAMPKIN, B. & ROSS, R. (eds), 2013. Future & Smart Cities. London: UCL Urban Laboratory. CARAGLIU, A., DEL BO, C. & NIJKAMP, P., 2009. Smart Cities in Europe. In: Proceedings of the 3rd Central European Conference on Regional Science (CERS). 7‑9 October, Kosice, Slovak Republic. CHESBROUGH, H., 2006. Open Business Models: How to Thrive in the New Innovation Landscape. Boston, Massachusetts: Harvard Business School Press. COHEN, B., 2012. The Top 10 Smart Cities on the Planet. Co.EXIST, January 11. COLPAERT, P., 2013. The Five Stars of Open Data Portals. Internal presentation. iMinds, Ghent, 17 October. DÖRK, M. & MOLTEYNE, D., 2011. Urban Co-Creation: Envisioning New Digital Tools for Activism and Experimentation in the City. In: Proceedings of the CHI Conference. 7‑12 May, Vancouver, Canada. ERICSSON, 2013. Networked Society City Index. Research Report, Ericsson. GREENFIELD, A., 2013. The City is Here for You to Use. In: Wired. 5 February. GREENFIELD, A. & SHEPARD, M., 2007. Urban computing and its discontents. New York, N.Y.: Architectural League of New York. GSMA, 2013. Smart Cities. Mobile Industry Report. GSMA.HALL, R., 2000. The Vision of a Smart City. In: Proceedings of the 2nd International Life Extension Technology Workshop. 28 September, Paris, France. HAMDI, N., 2004. Small Change: About the Art of Practice and the Limits of Planning in Cities. London: Routledge, 184 p.
HARTLEY, J., BENINGTON, J. & BINNS, P., 1997. Researching the Role of Internal-change Agents in the Management of Organizational Change. In: British Journal of Management. Vol. 8, pp. 61‑73. HILLENIUS, G., 2013. Jurisdiction Stops Brussels Region from Sharing FixMyStreet. Joinup, European Commission, 14 June. HOLLANDS, R., 2008. Will the real smart city please stand up?. In: City. Vol. 12, No. 3, pp. 303–320. IBM, 2009. How Smart Is Your City? IBM Institute for Business Value, Executive Report. JOROFF, M., 2008. Reshaping the Cities of the 21st Century. MIT School of Architecture and Planning. JULLIEN, B., 2004. Two-Sided Markets and Electronic Intermediation. IDEI Working Paper 295. Institut d’Économie Industrielle, Toulouse, France. KONINGS, R., 2014. Belgische app-ontwikkelaars ondertekenen eTIC-charter voor mobiele applicaties. Agoria, Press Release, 14 May. KUSHCHU, I. & KUSCU, H., 2003. From E-Government to M-Government: Facing the Inevitable. In: Proceedings of the European Conference on E-Government. Trinity College, Dublin. LIEBOWITZ, S. & MARGOLIS, S., 2000. Path Dependence. In: BOUCKAERT, B. & DE GEEST, G. (eds.) Encyclopaedia of Economics. Vol. 1, Cheltenham: Edward Elgar, pp. 981‑998. LINDSAY, G., 2011. Not-So-Smart Cities. New York Times, 24 September. PALKA, W., JURISCH, M., SCHRIEBER, V., WOLF, P. & KRCMAR, H., 2013. Mobile Government, Quo Vadis? Opportunities and Risks of Mobile E-Government Services. In: Proceedings of the International Conference on Mobile Business. Berlin. PATHAK, H., 2012. Organisational Change. Pearson Education, 388 p.
RATHBUN, B., 2008. Interviewing and qualitative field methods: pragmatism and practicalities. In: Steffensmeier, J.M. & Collier, D. (eds). The Oxford Handbook of Political Methodology. Oxford: Oxford University Press, pp. 685‑701. SCHUURMAN, D., BACCARNE, B., DE MAREZ, L. & MECHANT, P., 2012. Smart Ideas for Smart Cities: Investigating Crowdsourcing for Generating and Selecting Ideas for ICT Innovation in a City Context. In: Journal for Theoretical and applied Electronic Commerce Research. Vol. 7, No. 3, pp. 49‑62. SHEPARD, M. & SIMETI, A., 2013. What’s So Smart About the Smart Citizen?. In: HEMMENT, D. & TOWNSEND, A. (eds.). Smart Citizens. Manchester: FutureEverything Publications. STABELL, C. & FJELDSTAD, O., 1998. Configuring Value for Competitive Advantage. In: Strategic Management Journal. Vol. 19, No. 5, pp. 413‑437. STOTT, A., 2014. How to get your open data used. Presentation at the Data Days, 19 February, Ghent, Belgium. TOWNSEND A., 2013. Smart Cities. New York: Norton & Company. UNFPA, 2007. Linking Population, Poverty and Development. UNFPA Report. UN HABITAT, 2010. State of the World’s Cities 2010/2011. UN HABITAT Report. WALRAVENS, N., 2012. Mobile Business and the Smart City. In: Journal of Theoretical and Applied Electronic Commerce Research. Vol. 7, No. 3, pp. 121‑135. WALRAVENS, N. & BALLON, P., 2013. Platform Business Models for Smart Cities. In: IEEE Communications Magazine. Vol. 51, No. 6, pp. 2‑9. Nils Walravens is active as a researcher at iMinds-SMIT (Studies on Media, Information and Telecommunication) with the Vrije Universiteit Brussel since 2007. He has built up expertise on mobile services, smart cities and platform business models in the quickly changing mobile telecommunications market. He just finished working on a Prospective Research for Brussels project, funded by Innoviris and the Brussels Capital Region, researching the role of cities and public bodies in current and future mobile service business models.